Welcome to what I really wore, Tuesday edition. 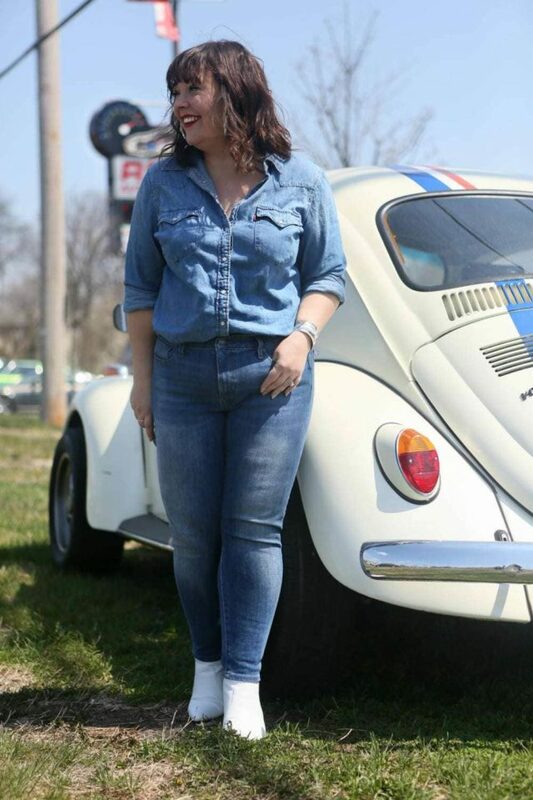 I wore this denim on denim outfit last Tuesday when we took our car in for an estimate for body damage. The Thursday prior, we were parked in a lot and another parked car rolled into ours. Unfortunately it did more than a little scrape. Fortunately, the gentleman who owned the car left his phone number and we contacted his insurance. $1,200 worth of damage – let this be a reminder to use your parking brake! Karl had his camera, we had an hour of sitting around, and well we saw Herbie and decided to take a couple shots. It was a sunny day but insanely windy so few pictures actually turned out. I'm glad because a few of you have commented on Instagram Stories about this Levi's shirt and now I can show it on the blog. While there may be minimal sizes for Levi's at department stores and online boutiques; Levi's directly has plus sizes and more lengths in all their classic styles. This shirt is a year old and only gets better with each washing. I love wearing denim on denim outfits and find it works best when you have a strong accessory. When I did this outfit, I ordered these booties to wear with it but they were backordered. I've wanted white booties for a while (I tried the ELOQUII ones in this post) and was psyched to see Naturalizer had a version. Naturalizer fits me well, the quality is great, and they have a variety of widths. These are a nice soft leather, zip up easily over my thick legs, and are pretty comfy. They're also cute with dresses and cropped pants and are lower contrast with my pasty legs than black or even tan footwear! Next Post Allyn vs. Legend: Which Dagne Dover Tote is Best for Me? 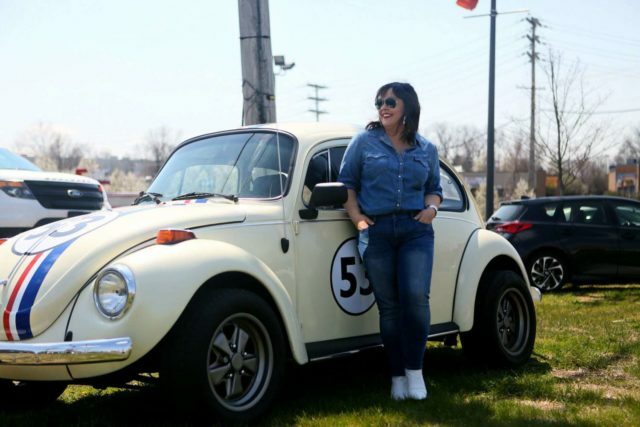 You and Herbie look so cute together. I love denim shirts. And though I would have preferred a buff or a brown or a gray boot, I admire your gumption to wear those white boots. I sooooo wanted a pair of white go-go boots when I was a child in the 60’s. Mom refused to add a pair to my wardrobe of sensible shoes: school, church, sneakers, and flip flops. I was crushed.